Cormous perennial with numerous semi-erect, narrowly linear basal leaves and many-branched stems bearing bright yellow flowers from spring to summer. To 1.2m. [RHSE, Hortus, CECB]. ‘This is certainly one of the most desirable of the genus, continuing to bloom for near a month.’ [BM t.771/1804]. 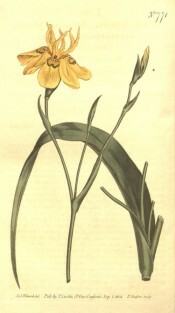 Moraea ramosa was introduced to Britain in 1789. [JD]. 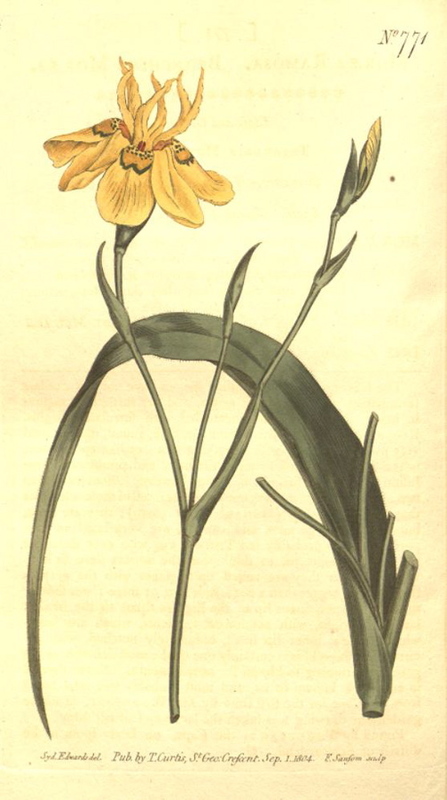 ‘The Moraeas, which are amongst the gayest and easiest cultivated of Cape-bulbs, have long gone out of fashion, and yet no plants of the kind exceed them in beauty; this is no doubt mainly due to the length of time during which their bulbs or tubers must be kept dry and at rest, when the plants are as so much lumber in the greenhouse. The present species is one of the most beautiful of the genus, and produces a great multitude of its golden flowers in succession, which expand fully in the sunshine, and ornament a house for a period of several weeks. It is a native of various districts of S. Africa, and was lately imported by our friend Mr. Wilson Saunders, F.R.S., through his indefatigable collector, Mr. Cooper. It was originally introduced into the Vienna Gardens so long ago as last century, and figured, in 1792, in Jacquin's magnificent "Hortus Schoenbrunensia." The specimen here figured flowered in the Royal Gardens, in May, 1868. Viessieuxia fuga (Tab. nost. 5438), also introduced by Mr. W. Saunders, is another species of Moraea (M. aeduli, Gawl.)’. [BM t.5785/1869]. Listed in the 1850 and 1857 catalogues [B.326/1850]. Moraea ramosa Endl. = Gladiolus carneus Delaroche which see.